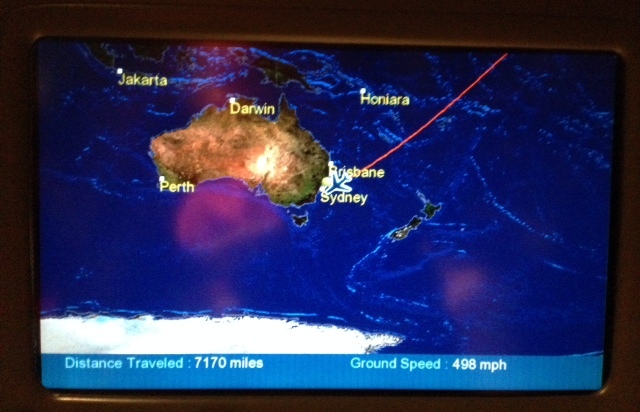 Week 1 on My Adventures in Australia….and it’s a biggie. I’ve been upside-down for a little over a week and I admit it’s a hard first one to sum up, mostly because jet lag makes you feel like you’re in a dreamy haze somewhere between hung-over and overslept. Combine this with being surrounded by a completely foreign environment, and time itself slips away like salt through a sieve. I’m an incredibly impressionable creature. This has both up and down sides. I’ve been journaling as much as possible. I cannot emphasize enough the importance of a daily journal when traveling. If you have a hard time writing, take photos. If you can’t take photos, keep a regular audio recording. This last one would be especially good for me. I try to make a point of keeping my native accent so as not to sound like I’m doing a poor impersonation of my friends. Regardless, I can hear my vowels softening. Accent aside, I’ve established myself here in Australia a bit. I’ve now got a phone number and a bank account, and a borrowed address. 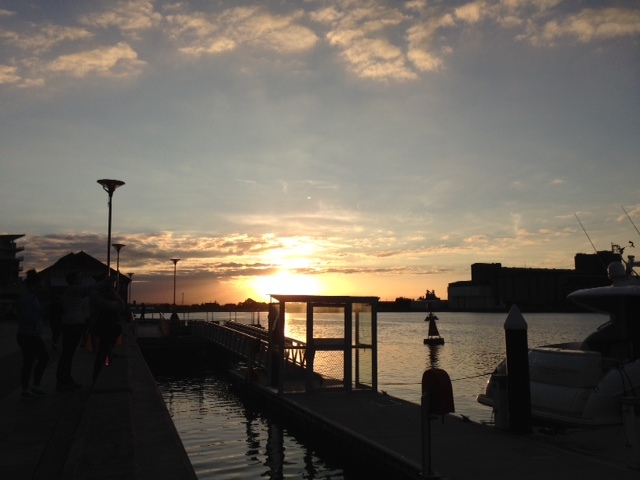 There are loads of things to say about all the differences in Australia but for today’s post I think I will keep it to first impressions via the senses. The 2.5 hour car ride to my temporary home was enough to fill a blog post alone. I will try to communicate some good traveling info for North Americans who would like to come here, but since this is a blog of impressions and not merely one for backpackers, that’s what you’ll get. 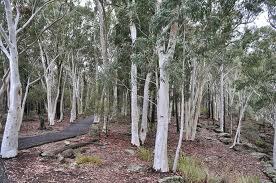 Gum trees. Lots and lots of gum trees. A gum tree is a variety, to which the famous Koala-sustaining eucalyptus belongs. Those and the non-bearing fig trees are everywhere, and the gum trees have a minty smell which I was picking up for the first few days but I seem to have dropped or have acclimatized to. My evergreens are nowhere to be found in this region. The land is fairly dry-looking to me, even near the water, although the beaches are absolutely glorious. Even the small beaches in the towns seem like such an enviable resource in my eyes. 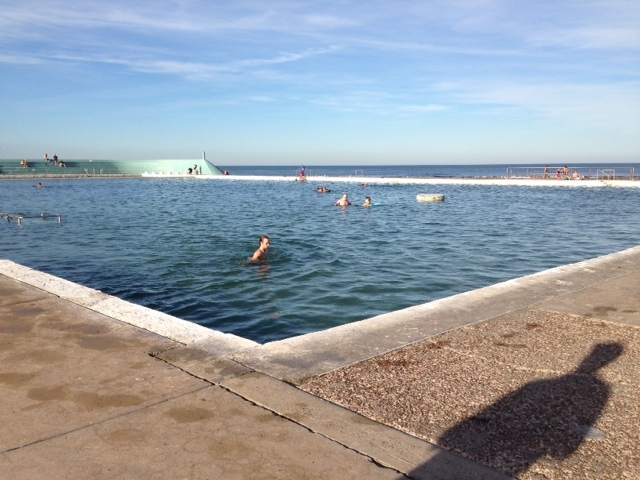 I took a swim in the ocean-filled pool the other day. Heavenly. I cannot get over the birds here. You know those cockatoos that sell in exotic pet stores in the states? Wild, bright yellow mohawk-feathered things just hanging about in the trees? They use fence posts as chew toys to the annoyance of the humans. 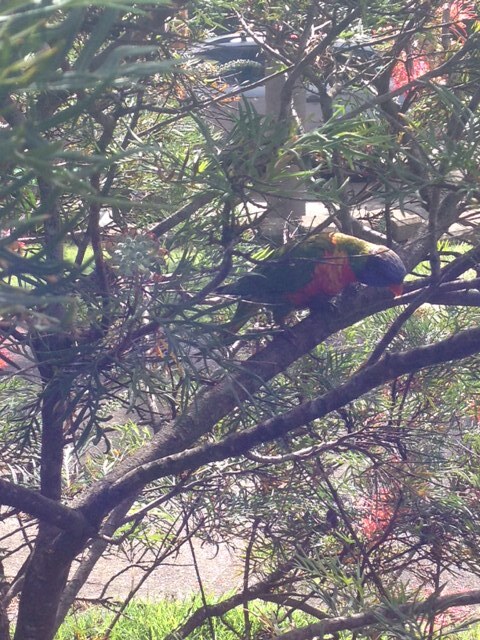 Rosella parrots sporting the whole rainbow can be found in people’s yard bushes and trees. The magpies look a bit like dominoes and sound like a goat or a small child which has made me rise out of bed a few times, the ibis acts a bit like a crow (getting into garbage bins), and the Myna birds also make some pretty weird noises. There’s also some funny looking sea hens everywhere. Think wild chicken. I haven’t seen any koalas, kookaburras, or live kangaroo’s yet, but look forward to it. 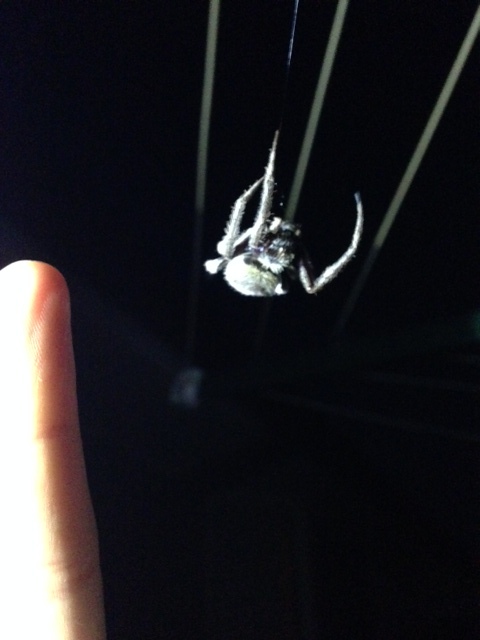 I have seen one very meaty looking spider about the diameter of a golf ball but with a body that looks like it bench presses my weight. I dared to get my finger close for a comparison photo but I definitely wouldn’t pick that guy up. 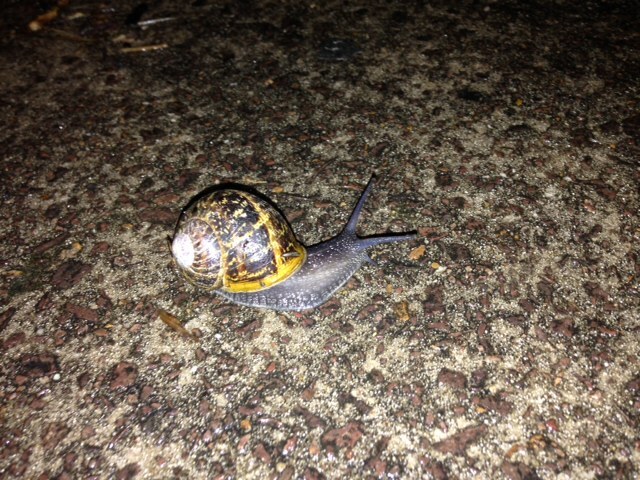 Snails are the new slugs….and they are big. Everything has a brightness to it, no doubt due to the sunlight. People wear brighter clothes in general too, compared to my Pacific Northwest. At least half of my carefully planned wardrobe is inappropriate. Live and learn. Travel is all about flexibility. I’ve already said a bit about this. I have been told that due to the Koala diet, they smell like tea tree oil. I also recently found out that Koalas feed their young not by regurgitation (which is already pretty gross), but by feeding their babies their excrement. I know. Gross hey? But if they have a mono-diet, maybe it still comes out like mulched grass? I apologize if you were eating your lunch. Nature has her ways. One creature can only be so cute. I can’t describe the rest of the smells. There are some usual ones, sea salt, raw earth…but my nose does not understand most of the others yet. A colorful friend in a neighbors shrub. Again, birds are everywhere, and they are chatty. I’m used to the migratory birds and springtime birds all calling out to get it on for a season or so…but these ones either have other motivations for being so vocal, or they are being lovebirds year-round. Aussies. I will be doing a whole blog post about their dialect. It’s almost another language. Americans, even from the most rural Americans I’ve met who’ve never left their hometowns to urban ones who stick to their subcultures, have nothing on Australian slang. Even well-spoken, upper middle class Australians use a slang word or phrase about every three sentences. If you are from North America, they will understand you perfectly well, and if you’re honest with yourself, you will ask them to repeat something every fifth sentence, just to learn it. Maybe in a few weeks, I’ll have it down a little better. But then again, maybe I’ll be introduced to new sounds consistently depending where I am. What does seem to be true everywhere is abbreviations and terms of endearment. Everything has a shortened regional or Aussie name. Some of them are suggestive, and everyone is quite casual about that. Once a term gets in people’s mouths, the businesses embrace them too and start advertizing with them. I expect I’ll leave Australia with a few nicknames myself. It’s autumn here, and sunny a lot though sometimes cool. I’ve been warned that I should wear at least 30+ sunscreen daily regardless of clouds. Australia has the highest incidence in the world of skin cancer, and it’s such a big deal, that the government has made a huge effort to keep people covered up. 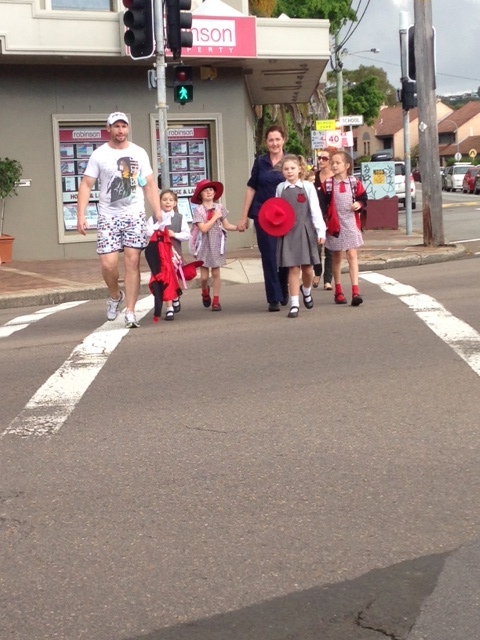 One variety of school uniform hat. School children wear uniforms here, and a required part of the uniform includes a hat. Different schools have different styles. A child without a hat on at the playground would receive the same reprimand as a kid without a coat on during a winter day back home. I suppose this adds up to a lot of hat hair. Clothes are flowy here, which I enjoy. Almost everyone hangs their clothes up to dry and very few people own an electrical drier. If you want permanent press, you’ll have to iron it. The other thing I feel around here is Mossie bites. (mosquitoes) They aren’t bigger than ours but the welts last longer and form a thicker, harder bump. Ouch! They aren’t too bad really, but something to be mindful of. Australians seem to be fairly affectionate people. I’ve received tons of hugs and kisses from complete strangers. Maybe it’s their general friendliness, or emphasis on hospitality. Whatever the reason, I’ve been grateful for it. I’m severely gluten intolerant, so I will not be enjoying a lot of beer here, but Australia is proving to be the very best place I have ever been for such an intolerance. Even in Newcastle, which is a smaller town, options abound in every single store. Everyone seems to know about gluten sensitivity and every waiter I’ve told about it knows exactly what gluten is and what food items they have that are gluten-free or can be made that way. Even most processed items seem to favor rice as a filler instead of wheat. I have had zero problems being a gluten-free vegan in Australia thus far. 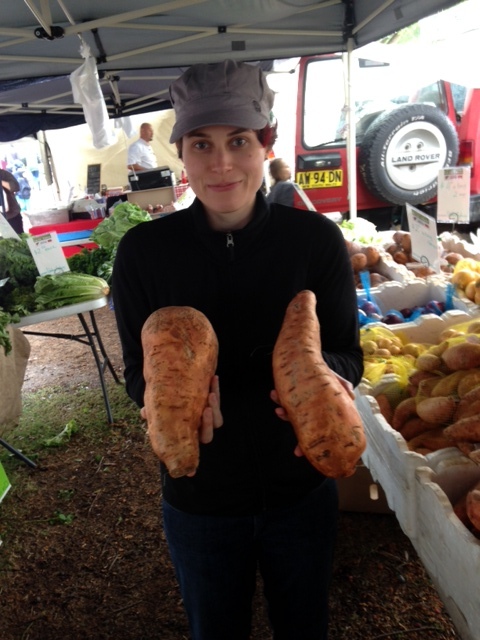 Those are some nice yams you got there! Australia has a big drinking culture. I don’t mean to say they have a big drunkard culture (though they may have that too for all I know), but it’s exceedingly common to have a beer or two every day after work. I’ll have to be silent as to the quality (since I can’t drink most of them) but I will say that Foster’s is NOT Australian for beer. I have enjoyed, with careful guidance by the father of a friend, some of the best wine I’ve ever had in my life. In particular, their local Australian Shiraz. I’ve only had one other wine experience that compares, and that’s been in Spain, buy a local connoisseur in Barcelona whom I will never forget. I won’t sugar coat the fact that food in restaurants is at least twice is expensive as in the states. I am only guessing that Australians afford this alright by a number of factors, including mostly eating at home and making an adult minimum wage of $18 and hour. Although organics is popular and produce is plentiful, regulations on pesticides is much more strict here, so for the most part I feel comfortable eating conventional foods that are about the same price as back home. They DO have a number of different names for things. A few examples….chard=silverbeet, bell pepper=capsicum, cilantro=coriander (the name we tend to use for the powdered variety). Drip coffee is nearly non-existent here. Yep. Sorry folks. They love their coffee, but they have no taste for filtered drip. Starbucks in Australia went bankrupt. Again…travel requires flexibility. Instead, you can have a small cup of fine coffee in the form of a long-black (americano) or a flat-white (espresso with steamed milk). Lattes and cappuccino are the same, but don’t expect big cups. It’s about quality here, not quantity. I have had wonderful food here thanks to a friend who is an expert chef and my taste buds have stayed rallied and waiting for the next adventure. I have discovered a lot here about culture, art, and ideas, and now that I’m all caught up on sleep and adjusted, I’m beginning to work on my own creative projects and writing scenes for my play “I’m from Up Over.” I’m also looking forward to taking in some Aussie theatre and literature. My current struggle is transportation. I’m flying by the seat of my pants here and trying to be frugal, but I will need a vehicle to get into some of the outback areas my heart is leading me to. My plan is to head up north to where it’s warmer for a bit, as winter is not their rainy season. I’ll probably find some day work there, but until then I’m hunting for a car I can use for a few months and turn around and sell when I head back down to Sydney. There’s a lot of driving in my future and today I had my first lesson in driving on the left side of the road from the right side of the car. (No accidents!) If you want to help out you can do so through my paypal button below and I will certainly credit you in the blog. Adventures and blogs to come! I will try to blog more often so they aren’t so long.